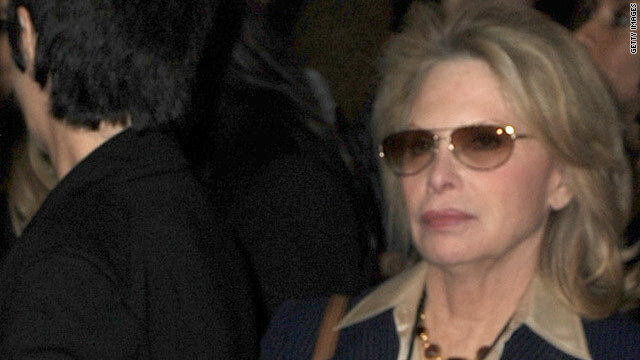 Publicist Ronni Chasen was shot to death in a posh Sunset Boulevard residential area. NEW: Police chief warns against "erroneous information, theories or speculation"
NEW: Beverly Hills mayor backs away from comments the attack appeared to be "targeted"
Los Angeles, California (CNN) -- Beverly Hills Police Chief David Snowden asked journalists to keep "erroneous information, theories or speculation" out of their stories about the killing of a Hollywood publicist, but his appeal appeared to be a reaction to reports quoting his own mayor. Beverly Hills Mayor Jimmy Delshad told reporters Thursday night that the shooting death of Ronni Chasen in a posh residential area early Tuesday appeared to be a planned attack from an SUV. The 64-year-old public relations veteran died from shots fired into her Mercedes-Benz as she turned off Sunset Boulevard on her way home from a star-studded premiere celebration for the movie "Burlesque." "The most indication is that it was targeted," Delshad told a Los Angeles TV station Thursday night. "A random killing will not happen like this, five shots in a chest area, and it seems like it wasn't just a random killing." The mayor, who said he had gotten his information from the police chief, backed away from his comments Friday morning, after a call from the chief. Deputy City Manager Cheryl Friedling, the mayor's spokeswoman, told CNN "it would be wise not to go with the mayor's speculation." "This type of media coverage can only jeopardize the integrity of the investigation," Snowden said. He urged the news media to be patient while the investigation goes on. The lack of official information about the case has fueled fear and speculation among wealthy residents. "I would like to assure the public that this was a rare, isolated incident and that the Beverly Hills community remains one of the safest in the nation," the chief said Friday. There is no prevailing theory on if the attack was road rage or a planned hit, a police official said. Detectives are still trying to determine exactly where the shots were fired, Beverly Hills Police Sgt. Lincoln Hoshino said. Several 911 calls reporting gunfire were placed from homes along a four-block stretch of Sunset Boulevard, he said. The first call came from near the Beverly Hills Hotel, while later calls reporting gunfire came from three or four blocks down the street. Chasen's car turned off of Sunset Boulevard onto Whittier Drive and came to a stop against a light pole about two blocks away, he said. Investigators canvassed the neighborhood of expensive homes for video of her car or the attacker, Hoshino said. "Quite a few residents" along the way have security cameras, Hoshino said. The shots that struck Chasen were apparently fired through the passenger door window, he said. She was the lone occupant of the car. Chasen left a voice mail at her office just minutes before the shooting, police said, an indication that she was not aware of anything out of the ordinary. Chasen had been on the red carpet at Grauman's Chinese Theatre, walking with songwriter Diane Warren as she and "Burlesque" star Cher were interviewed about the music in the film. Warren, who contributed the song "You Haven't Seen the Last of Me" to the movie's soundtrack, said Chasen also went with her to the after-party at Hollywood's W Hotel.